Roman Abramovich is said to be ready to pay the whopping release fee for the Porto boss, and Portuguese press are claiming that the Blues are already in talks with the 33-year-old tactician. Inter Milan made an approach for Villas-Boas over the weekend, but baulked at the €15m clause in his contract, leaving the door open for the mega-rich west Londoners. Porto president Pinta da Costa also acknowledged that there was nothing he could do to stop the man dubbed ‘the mini Mourinho’ from leaving the Portuguese treble winners. 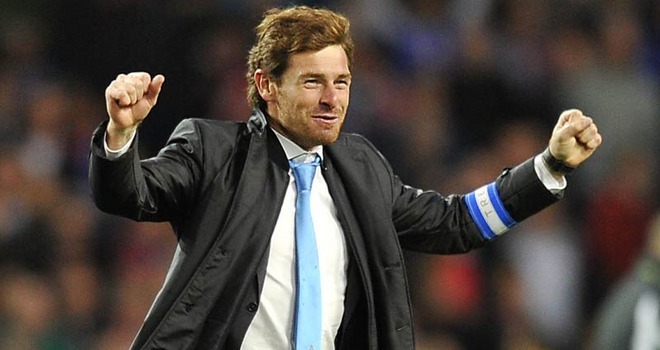 ‘Villas Boas has a contract and a clause of €15million,’ said da Costa. ‘If someone deposits €15million into our account and he wants to go, we cannot do anything because it is something that is contractually specified.’ Chelsea have also been reportedly locked in talks with Guss Hiddink over the possibility of him returning to the club as sporting director, which would leave space for Villas-Boas to join the Blues boot room.He is a protegé of former Blues chief Jose Mourinho, and worked with him at Porto, Chelsea and Inter Milan before embarking on his managerial career in 2009.After one year with Academica, he was appointed Porto chief in 2010 and he has blossomed in the role. Villas-Boas insisted after the Europa League final win that he was committed to Porto but that resolve now looks as if it could be tested.The Porto manager will be familiar with many of the current playing squad; having been part of Jose Mourinho’s coaching team from 2004 to 2007. During that time he was responsible for putting together the detailed technical reports on every opponent that was one of the hallmarks of Mourinho's Chelsea reign.